This pretzel-like network is the “blob” stage of the pretzel slime mold. It is in the process of developing spore-producing structures, which are the fuzzy portions. The bare woods of late fall in Westborough harbor odd forms of life known as slime molds, including those with strange, descriptive names like wolf’s milk slime and pretzel slime. A glimpse of these two slime molds rewarded the folks who trekked into Wile Forest (adjacent to the Town’s Libbey Conservation Area) on the Westborough Community Land Trust’s fall mushroom walk in late October. Walk leader Larry Millman, author of the reader-friendly field guide Fascinating Fungi of New England, diligently checked the abundant fallen logs and rotting stumps and pointed out about 50 kinds of fungi forming caps, cups, flat crusts, or stains on dead wood. He also found slime molds, which may look like fungi at certain stages of their lives but really aren’t fungi or molds at all. Wolf’s milk slime (Lycogala epidendrum) appeared as small salmon-pink balls (only one-eighth to one-half inch wide, shown greatly enlarged in our photo) on a rotting log on the ground. These pink balls had pasty pink goo inside, but they were on their way to maturing to a gray color, with dry, powdery, gray spores inside. They look very much like the fungi known as puffballs. And if you poke one of the mature gray balls of this slime mold, you’ll probably see it give off a puff of spores (just as a puffball might do). The same may happen if you blow on it, or when the wind blows on it. Wolf’s milk slime is sometimes called toothpaste slime because of the pink goo inside, but it’s not used as toothpaste. The name wolf’s milk comes from the goo’s resemblance to the milky sap of an invasive plant called wolf’s milk (Euphorbia esula). The scientific name of this slime mold includes the word “epidendrum”, meaning “on wood,” describing where this slime mold is found. Besides the pink or gray balls that are its reproductive, spore-producing stage of life, this slime mold – like others – has additional, less obvious stages that are just as strange and amazing. What happens to the spores, for example? If they land on a favorable place – say, on moist, rotting wood – they eventually germinate, becoming individual cells known as swarm cells. The swarm cells move around on their own, and they can divide to produce more swarm cells. If conditions are not good – too dry or too cold, for example – the swarm cells can go dormant as tiny cysts, and later turn back into swarm cells when conditions are better. Another possibility is that two swarm cells may join. This is where the “slime” part of a slime mold’s life comes in. The fused cells grow into a new, larger, gel-like organism. This transparent blob flows along, taking in food as it creeps around. It’s actually a kind of giant cell. But don’t worry, it won’t get large enough to use humans as its food (unless you believe the old 1958 science fiction horror movie, “The Blob,” which may have been inspired by slime molds). The blob’s food is microscopic – bacteria, yeasts, spores of real fungi, decaying plant and animal matter, and the like. The blob is the feeding stage of a slime mold’s life. A biologist would call the blob a plasmodium. Why aren’t slime molds considered fungi? Their way of feeding is one big reason. The difference is a matter of internal digestion versus external digestion. The slime mold takes its food inside itself and digests it internally. (Sound familiar? We can think of ourselves as operating this way.) In contrast, a fungus releases chemicals into the surrounding environment, where these chemicals digest material externally, and the fungus then absorbs the results. What is it? Candy or something sinister? Neither – it’s a slime mold, which is not a mold or fungus. 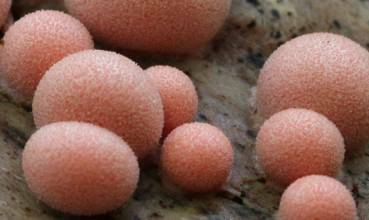 These 1/8- to 1/2-inch pink balls – greatly enlarged in the photo – are the spore-producing structures of the slime mold called wolf’s milk slime or toothpaste slime, named after the pink goo inside. Slime molds aren’t plants or animals either. These days they’re classified as protists, a diverse group of relatively simple organisms that also includes algae, tiny blob-like amoebae, and others. When it comes to survival, the blob stage of a slime mold is versatile. If environmental conditions become unfavorable, the blob can spread out and harden into a resting stage. When conditions get better, it can become a blob again. For reproduction, the blob turns itself into spore-producing structures. While you’re walking in the late-fall woods, you might notice pretzel slime mold (Hemitrichia serpula). Its color is yellow-brown, like pretzels. Different parts of this blob flow in different directions, producing a pretzel-like network of strands that eventually develop into fuzzy spore-producing structures (as seen happening in our photo). Typically, spores are gradually released as these structures dry out. Closer to home, on wood chips, you might spot yet another slime mold sometimes called dog vomit slime (Fuligo septica). It looks like a foamy, mottled yellow mass that can remind people of exactly what its name describes. It tends to grow on mulch made of wood chips. If you find this slime mold, don’t worry – it won’t harm anyone, or anything in your garden. In experiments, scientists have chopped up the blob stage of a slime mold and put the pieces into a maze. What happened? The pieces crept around and joined together again, and then went directly to food in a different part of the maze. How could it do this? 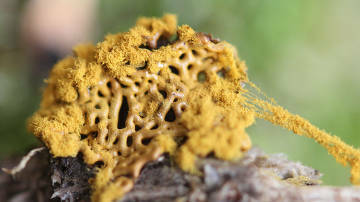 The slime mold follows chemicals – much as we might follow a scent – both to find other pieces of itself and to find food. If you take kids for walk in the late-autumn woods, encourage them to look for slime molds on dead wood. Of the all the different stages – spore-producing structures, spores, swarm cells, cysts, and blob – the spore-producing structures are usually most visible, and quite varied. Besides balls and fuzzy pretzels, sharp-eyed youngsters might find balls with stalks, blackberry-like clusters, and more.